Hey all, in case you needed another good reason to buy your KCNC brakes from me instead of anyone else out there on the internet this is it: the +1lap affiliates referral program. 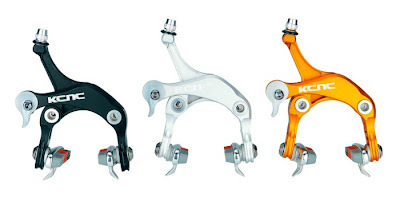 This is the deal: anyone who buys a pair of KCNC brakes from +1lap at the MSRP of $300 will be eligible to be enrolled in the affiliates program. What is it? You will earn $10 for every friend you send to me that also buys a set of KCNC brakes and says that you sent them. Yes exactly, $10 for every referral you send me that buys a set of brakes. I will send you your referral bonus via Paypal immediately after your friend buys a pair. To sweeten the pot, I will send another $50 to you after you refer the sale of 20 pairs of brakes. Your friend also becomes eligible to be enrolled in the affiliates program as well. This is a selling point that you can mention to them when they weigh their options about where to purchase these fine braking instruments. No other cycling retailer I know of offers this wonderful opportunity. Pyramid scheme? Hardly. I will send out the dough immediately to you once the purchase is made. Think of it as my advertising campaign. Amazon does it. To enroll, you must first purchase a set of the KCNC brakes yourself and then ask to be placed in the affiliates system. Refer the sale of 25 brakes and you make back the $300 you spent on your own pair! Email me at plusonelap at gmail dot com with questions. Another thing I've been working on is importing some of these sweet brakes from KCNC. The brakes are going to kill the Zero Gravity market. Their lighter and the lucky few whom have ridden them state-side say that they stop better. Oh, and their cheaper. I am running a pre-sale on them currently. Meaning, I have placed my order with KCNC and am just awaiting them to come across the ocean from Asia. They are going to be the next hottest thing in the low weight bike world. I have placed a small order with KCNC, if you would like your name associated with one of those few sets email me at plusonelap at gmail dot com. I have black and a few silver sets coming. Let me know which color you want. The price is $315. Compare this to Zero Gravity's which are selling on Ebay for $330 plus $10 shipping, and you'll see the bargain. Again, email me at plusonelap at gmail dot com to place your order and/or find out more info about these brakes. Hey guys and gals, well not much posting lately on +1lap. I know. I got accepted to Boston U. and Babson College business school for next fall. I was spending the last weekend in Boston touring both campuses and am fairly certain that BU is where its going to be. So yeah, been busy with that. Also, preparing for the coming season, and am planning to race the Portland Spring Duathlon and Vancouver TT series. So, with that, keep checking back in for updates, especially with Worlds next week. 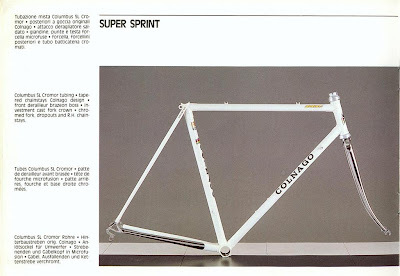 BTW---not sure if I posted this before, but found this scan of a Colnago catalog from 1988. And I think its my bike. There are many Colnago's out there. With very small deviations in each model. Why do I think this is mine? The right chainstay and rear dropouts are chromed. Fork is chromed (my bike has a chrome under the white, but I had them powdercoat over it because the chrome was in very bad shape). The fork crown has the C with the clover inside of it. 2 cable guides on the top tube. Non fluted seat stays with the Colnago panto'd into them. Thats about it. I haven't found another Colnago that had all of that in common with my frame. As I can see now, my decals aren't "accurate" for the Super Sprint. But thats okay with me. I love the poser WC stripes. I'm not worried anyone's going to confuse me with a World Champ anyway. Finally built her up last week and was able to snap some shots this weekend. She's been built for some time now, but I didnt want to post pics until every last detail was in place. Even so, there are a few things that are still on the way or in the works to make this beauty queen even more glamorous. But this will do for now. I am considering swapping out the saddle. Also the stem is pretty sweet, I think its an ITM, but I just bought a pantographed Colnago stem that will be even sweeter. Another item I have that I was able to find was this sweet Colnago bottle cage. I think they are fairly rare as I only ever seen a picture of one other. They were probably $3.95 back in 1981. This one has some chipped paint, I'm considering a repaint, but I want to save or recreate the Colnago decal first.